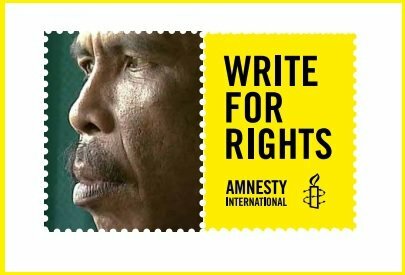 Every year in December, Amnesty International kicks off its “Write for Rights” campaign addressing twelve cases of human rights violation. One of this year’s cases is the Maluku teacher Johan Teterissa who is currently serving a 15-year jail sentence for raising South Moluccas’ flag and leading a peaceful protest in 2007. Amnesty International encourages human rights supporters across the globe to write letters and emails in support of those whose basic human rights are being attacked. He’s a primary school teacher with a passion for human rights. But right now, Johan Teterissa is serving a 15-year jail sentence for raising a flag banned by the government. In June 2007, Johan led a group of 22 mainly teachers and farmers in a peaceful protest in front of Indonesia’s president. They performed a traditional war dance, before unfurling a “rainbow” flag, a historical symbol of independence for the people of Maluku province, in eastern Indonesia. Police immediately removed Johan and the others, punching and beating them. They took the men to several police stations, at one point forcing them to crawl on their stomachs on hot asphalt, whipping them with electric cables and beating their ears with rifle butts until they bled. The torture continued during official questioning. Following a plainly unfair trial, all the men were convicted of “rebellion”. Johan was sentenced to life, reduced to a 15-year sentence. He is still in a prison, thousands of kilometers from his family and friends. Tell Indonesia to free Johan without delay. Write to the Minister of Law and Human Rights. Tell him to immediately and unconditionally release Johan and the 22 other protestors. Until his release, he should be immediately transferred to a prison closer to his family. 31 December is Johan’s birthday. Send him a special wish and show him he is not alone.